GCPD Lockdown, the latest piece of story DLC for Batman: Arkham Knight, is another reminder of why I’m forever grateful I didn’t plunk down the extra money for the pricey Season Pass for this game. Outside of the Batgirl mission, the narrative missions for both Harley Quinn and Red Hood were insultingly short and added little to the lore of the Arkham franchise. This latest mission starring the first Robin, Nightwing, sells itself as taking place after the events of the main game, leading players to believe that perhaps they may get some questions answered posed by the games ambiguous secret ending that I won’t go into details here for those who haven’t yet finished the main game. Other than a few throwaway lines, little is revealed about the Arkham universe, post Knight, so what we’re left with is another inexpensive twenty-minute campaign that’s reasonably priced at $2. 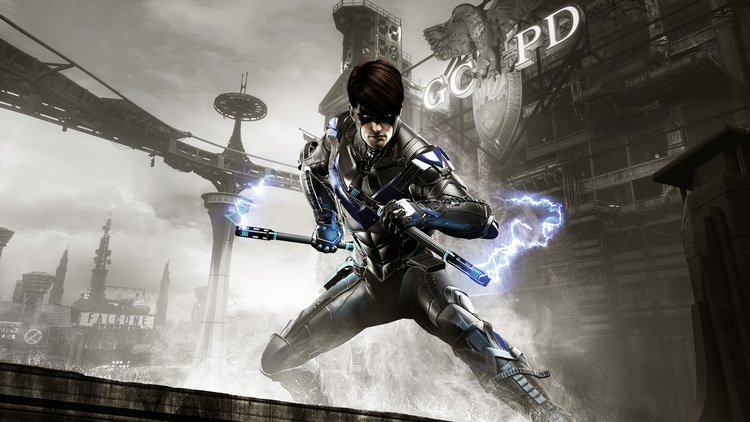 Taking place after the events of Batman: Arkham Knight, you play as Nightwing who springs into action when he receives intel that the Penguin is planning on breaking out of the GCPD. Those who played the Harley story that came with the game, or the since released to the public Red Hood DLC should know the drill for GCPD Lockdown: A fight, a predator sequence, and then another fight. This time there’s no boss fight, which is not a problem here as both Blackmask and Nightwing were just tedious battles as you whittled down a pointlessly long health meter. Though all three characters in the Gotham City Story campaigns more or less all play exactly like Batman, Nightwing feels the less unique amongst the bunch. Red Hood had his guns, and when playing as Harley we got to see the world through her eyes, but Nightwing lacks anything special other than his tonfa’s which feel much like Robin’s staff from Harley Quinn’s Revenge. The rest of his arsenal, save a move that sends out a shock wave which I didn’t need to use once, is just cribbed from Batman’s utility belt. As a huge fan of Nightwing who was very excited when he was first shown to be included in the story, I’m disappointed that Rocksteady has done such little with the character. He’s the first Robin and the closest to being an equal to Batman, yet the only difference we get is not in the how the character plays or feels, but his less sombre take on crime fighting which is shown through his dialogue that can be funny, but is in short order. Provided you’re paying for this piecemeal like I am, $2 is not a lot for this brief, uneventful campaign but I can’t help but feel a little let down by GCPD Lockdown. For being marketed as taking place after the main story, it doesn’t really do much with what was presented in the conclusion of the main story, and what you’re left with is just a few more fights and a predator sequence. Hopefully in the final few months Rocksteady will step up their game and make those poor people, both literally and figuratively, who paid for the Season Pass feel like they didn’t get ripped off, but this late in the game, that looks about as bleak as Gotham City.